The Abstract Spring peyote bracelet pattern is designed by Jennifer VanBenschoten. It is an even count peyote stitch pattern. It is available for download for your personal use at the link. To read the word chart, start from the bottom left corner and works from bottom to top. The full Abstract Spring peyote pattern is shown here in three different color variations. The Abstract Spring pattern is designed using software called Bead Tool 4 which offers a free download as well as a paid version that has more features. Using bead design software is the easiest way to design patterns. One of the best features of the software is how easy it is to change the color palette of a design. You can always change the colors you use on any pattern - it's just that when you use software, it allows you to preview the results before you have stitched it up. Bead Tool 4 comes with the color palettes of Miyuki, Toho and Preciosa beads pre-loaded in the software, so you just need to select the colors to add to the design. You can also pre-load the beads in your inventory into the tool. This feature is useful for you to make sure you design using bead colors that you already own, or to help you substitute colors. The Abstract Spring color variations vary the look of the pattern by applying light and dark backgrounds as well as tonal color variations in the design. 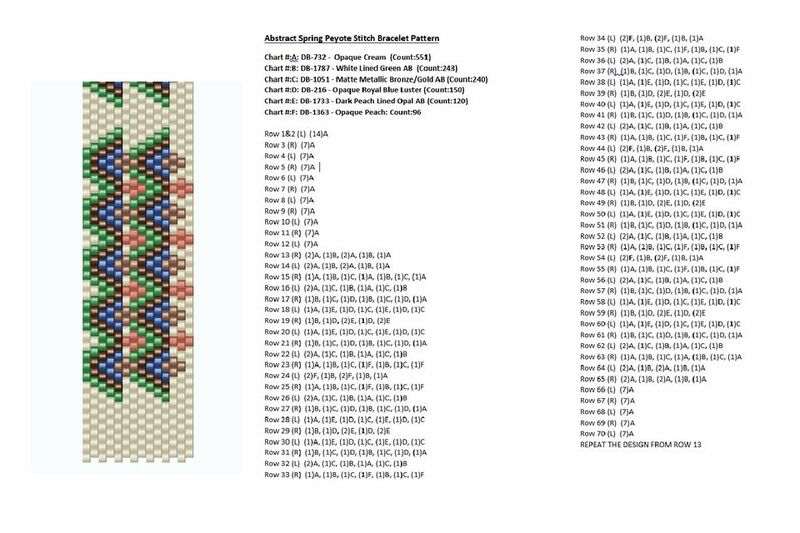 The information on the beads used in these patterns is available for download at the link. All of the bead colors listed for the peyote stitch designs are Delica beads since they provide the evenest results when using peyote stitch. If you don't mind a more freeform (i.e. slightly uneven) beadwork bracelet, other beads can be used, but do your best to cull the beads to give yourself similar sizes and shapes to work with. Vastly different sized beads will make the band uneven and possibly expose the thread, making it more likely to fray. This block uppercase alphabet peyote pattern can be used as a starting point to customize your own designs. It can be used to add initials to design or add words or phrases. These are especially useful for affirmation style bracelet designs. Some common words for affirmation bracelets include breathe, dance, dream, hope, joy, laugh, live, love, and peace. There are many others. See what words speak to you and design your own bracelet or necklace strap. This breathe affirmation bracelet pattern uses the letters from the alphabet pattern combined with some simple shapes. When designing a bracelet or band using the letters, you can choose to write the word once in the center or multiple times. Just be sure to plan the length of your project appropriately so you don't cut off words! This is an example of how you can design your own affirmation bracelet using the peyote stitch letter pattern. The Love affirmation bracelet peyote pattern uses a variation of flat peyote stitch called two drop peyote. The basics of two drop peyote stitch are the same as regular peyote stitch, except you pick up two beads per stitch. Like regular peyote stitch, there is an even count version of the stitch and an odd count version of the stitch. Since the first row of the Love affirmation pattern uses six columns of two beads each, it is an even count peyote stitch. Even count peyote stitch is always slightly easier than odd count peyote stitch. Note that the difference is very slight and it will only take one project to learn odd count peyote, so never avoid learning the odd count version. It makes your patterns much more fun when you can center designs! Like the other patterns, the Love two-drop peyote stitch pattern is available for download at the link. The word chart works from the bottom left-hand corner up. If you are following the pattern and the word , you may want to trim the pattern from the top of the page and turn it to the side so it sits the way that the word chart is set up.